What will Iowa City look like in 2030? Don’t miss this multimedia performance, featuring songs by the Awful Purdies and stories by American Book Award-winning author Jeff Biggers at the historic Old Capitol Senate Chambers, on Friday, March 25th. 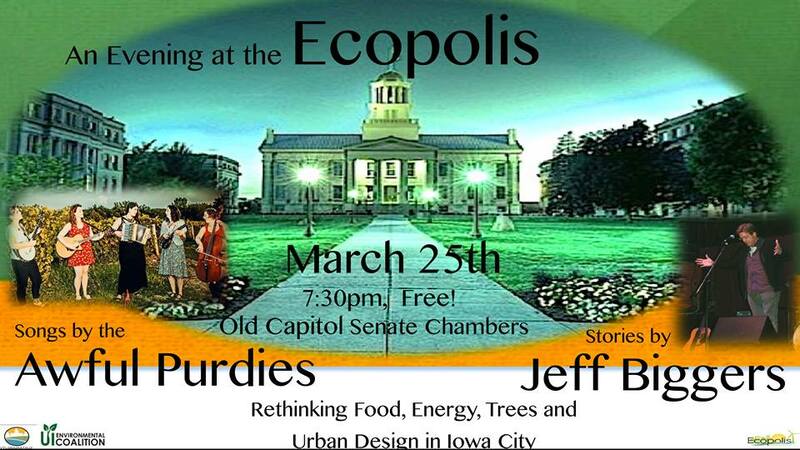 “An Evening at the Ecopolis” showcases local heroes and presents a vision for a flourishing “regenerative city,” based on renewable energy, local food, zero waste, an Iowa River and prairie revival, and inclusive and strategic urban planning in an age of climate change. Sponsored by the University of Iowa Environmental Coalition, the event is free and open to the public.